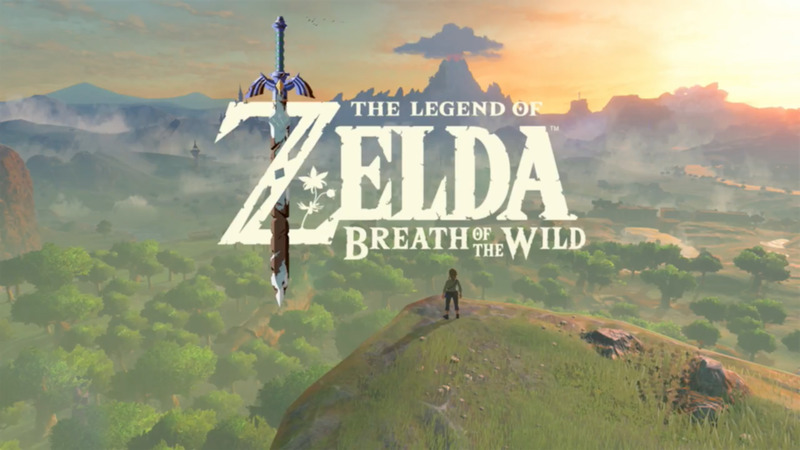 Ever since we got our first look at Breath of the Wild at last week's E3 conference in LA, Zelda fans across the internet have been speculating as to where in the notoriously convoluted Zelda timeline the new game will fall. Is it pre-Ocarina of Time, before the split? Does it take place sometime after Wind Waker in the 'Adult Link' timeline or does it follow on from Twilight Princess in the 'Child Link' branch? Maybe it's set on the controversial 'Fallen Hero' arc of the timeline? There's been next to no information about the story within Breath of the Wild so far, but there has been a couple of little clues dotted around the footage shown in Nintendo's Treehouse Live presentation that may give an indication as to it's placement. 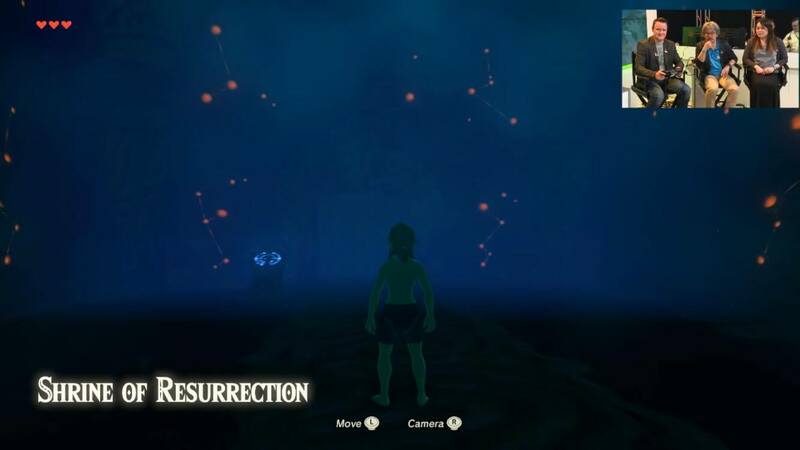 A fellow Zelda Universe writer has explored this predicament in great detail themselves on the site, and have come to the conclusion that Breath of the Wild takes place on the fallen hero timeline. It's a great piece that takes the Sherlock Holmes approach of elimination, and that whatever remains, however improbable, must be the case. Myself, I've gone for the opposite approach and rather than trying to work out where it doesn't fit, instead use the few clues we have so far to hazard a guess as to the most likely placement. The ZU piece, once it's established that the game takes place after the Ocarina of Time fork in the timeline, moves on and eliminates the Adult Link timeline from the equation too. However, I believe this is dismissed far too quickly and is in fact, given what we know so far, the most probable place for the game to be positioned. The adult timeline takes place after the events of Ocarina of Time and incorporates Wind Waker, Phantom Hourglass and Spirit Tracks. At the end of Ocarina Ganondorf is sealed away. Eventually though, Ganondorf breaks free and wreaks havoc on Hyrule, and despite the people's prayers to the gods, the Hero of Time does not return to save them. King Daphnes Nohansen Hyrule decides to leave the fate of his kingdom in the hands of the gods, who then choose to flood Hyrule, sealing the kingdom, along with it's king, and Ganondorf, beneath the ocean. It is this act, and the character of Daphnes Nohansen Hyrule, that I believe holds the key to Breath of the Wild's placement. One of the more surprising elements of the Treehouse Live footage shown at E3 was the inclusion of the Koroks. These characters have only ever appeared in Wind Waker, which lends weight to the Adult Timeline placement of Breath of the Wild. The history and origin of the Koroks is explained in Wind Waker by the Great Deku Tree. 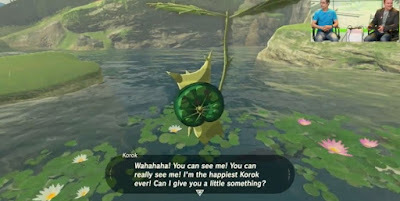 He tells how Koroks are “spirits of the forest” and “little children of the woods.” Moreover, the Great Deku Tree considers them to be his “cherished little children.” Most crucial though is this line: “Once upon a time, long ago, the Koroks took on human forms, but when they came to live on the sea, they took these shapes.” So the Kokiri, the forest children of Ocarina of Time eventually become the Koroks of Wind Waker. Indeed this is confirmed in Hyrule Historia. 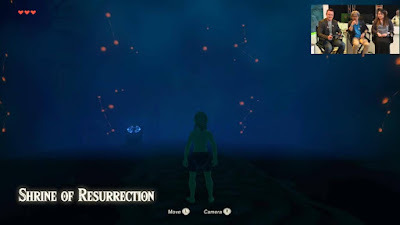 This transformation happened as a direct result of the great flood and so it stands to reason that Breath of the Wild takes place sometime after Wind Waker. But hold on, I hear you cry, we know what happens after Wind Waker already. Indeed we do. Ganondorf is defeated by Link and Tetra, the Master Sword embedded in his skull and his body turned to stone. The Hero of the Winds and the Pirate princess then head off across the ocean in Phantom Hourglass in search of the New Hyrule which is then established and plays home to the events of Spirit Tracks. But what of the Old Hyrule, lost beneath the flood? What of Ganondorf and the Master Sword? What of King Daphnes Nohansen? They all remain under the ocean for the rest of time. Or do they? In his final monologue before sending Link and Tetra off in search of a new kingdom they can call their own, he says "If only I could do things over again. Not a day of my life has gone by without my thoughts turning to my kingdom of old. I have lived bound to Hyrule." We already know that Daphnes has lived for hundreds, if not thousands, of years, from the flood to the events of Wind Waker. There is nothing to suggest he cannot go on living beneath the sea, washed away with his beloved Hyrule. Perhaps Nohansen's desire to restore Hyrule to it's former glory led him to call upon the gods - or even utilise the power of the Triforce - to drain the ocean? This explains why the Temple of Time we see in the Treehouse footage is in ruins, having spent so many years at the bottom of the Great Sea. The rusted, dilapidated state of the Master Sword in the trailer indicates it's deterioration, tarnished by it's many years lost in the ocean depths. It also explains why the Koroks are now living in a world devoid of the Great Sea of Wind Waker. Furthermore, in footage of Link foraging in Breath of the Wild, we see our hero acquire Rock Salt whilst exploring a mountain. The description describes it as "Crystallised salt from the ancient sea", which is surely a reference to the Great Sea of Wind Waker? In his pursuit of restoring Hyrule to it's former glory, Daphnes inadvertently broke the seal securing Ganondorf in stone. This calamitous act released Ganon to wreak the havoc described by the old man in the opening stages of Breath of the Wild. This is why the enemy that is 'just barely contained' within Hyrule Castle is referred to by the old man as the Calamity Ganon. Indeed the only other reference we've seen to the old enemy, by the monks at the end of each Shrine, only refers to Ganon, with no 'Calamity' epithet. Perhaps this is something only Daphnes - and the people of Hyrule who know of his mistake - add to the Ganon name. 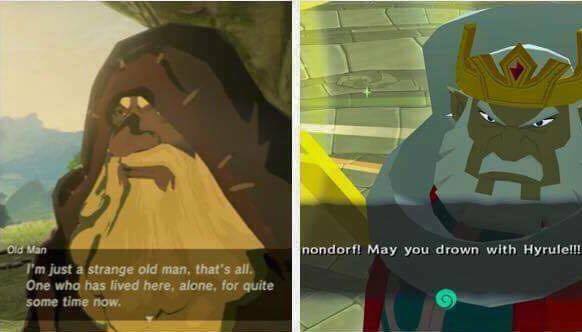 When we first encountered the Old Man at the beginning of the game play footage of Breath of the Wild I immediately shouted out 'that's the king of Hyrule!' The resemblance between the two, I thought, was uncanny. This supposedly random hermit also seems peculiarly knowledgeable about the kingdom. He gives Link a history lesson about the Great Plateau upon which they stand being the birthplace of Hyrule. He also wistfully describes the great ceremonies that used to take place in the Temple of Time. Once Link uses his Sheikah Slate to activate the resurrection tower, the old man asks him if anything unusual happened whilst he was at the top of the tower. Once Link tells him about the voice he heard, the old man replies 'I suspected as much' and then asks Link if he recognised the voice. When Link tells him he did not, he replies that it is a 'shame.' This I think, allows us to further speculate on what is occurring in Breath of the Wild. Link starts the game hearing a voice telling him to wake up. He emerges, not from beneath a duvet but in some sort of bath of a mysterious liquid. We are then told that this room is in fact called the Shrine of Resurrection. I'm speculating somewhat wildly now, but join me on the ride. What if, knowing the evil he had inadvertently unleashed, Daphnes sought some way of resurrecting the Hero of Time in order to banish it? Once again, this seemingly random old man knows a hell of a lot about an ancient and mysterious tribe. He also describes them as 'advanced'. Given the close ties between the Sheikah tribe and the Hylian royal family, it would make sense that the King would know this, and would also have heard tales of some of their advanced power. Perhaps even bringing people back from the dead? I propose that Daphnes set about tracking down some of the advanced technology of the Sheikah in order to revive the Hero of Time to claim the sword of evil's bane, now hidden away in the wooded area shown at the end of the Breath of the Wild trailer (the sacred grove perhaps?) restore it to it's former glory, and cast Ganon back once more. This theory is by no means perfect. It neglects the 100 years Aonuma says Link has been asleep prior to the start of the game. This fact would also mean Link's slumber started at the same time that Calamity Ganon laid waste to Hyrule. (This information is gleaned from this footage my colleagues at Zelda Universe took of the opening segments of the game). This could be crucial, or it could be coincidental, we just don't know yet. Another argument against the Link of Breath of the Wild being the same Hero of Time as Ocarina of Time is that the newer incarnation is right handed, whereas the original Hero of Time was a lefty. Aonuma doesn't seem to think this apparent ambidexterity is all that important to the story though, giving the excuse that he's right handed because that's where the buttons are on the controller. So if Aonuma can dismiss it, so can I! Safe to say, any timeline placement - and any story details - are complete speculation at this point. We will no doubt get an official timeline placement before long, and if not there will be plenty of speculation and analysis once the game releases and we have more information. Until then though, for my money, a post Wind Waker, Adult Link timeline placement makes the most sense.